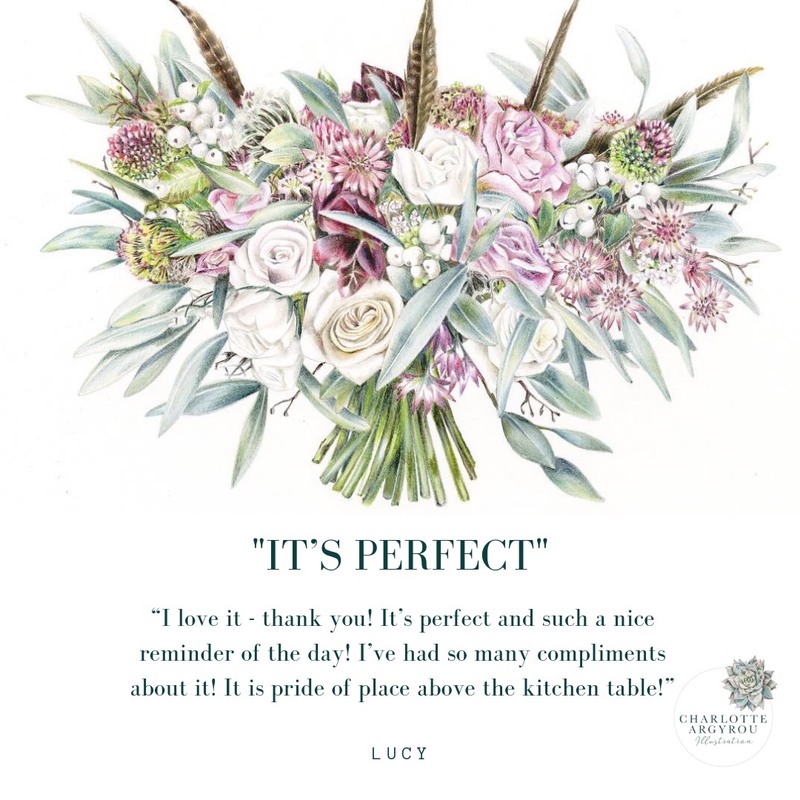 Home / Home / How Does the Wedding Bouquet Illustration Service work? Maybe the answer is devastatingly simple, but I just work from photography. Usually, a couple buying for themselves or a groom buying for a special present for his missus will wait a few weeks and send me their professional photography. A handful of images is ideal, so I can clearly see all the different floral species and work out the best composition. But if there’s only one decent image of the bouquet, that’s absolutely fine. Often, I will ask for your florist’s details, so that I can quickly check the list of species featured. It’s a small detail, but one that means both you and I know your illustration is a true representation of all your wonderful wedding day memories. Sometimes a relative buying the Wedding Bouquet Illustration Service as a surprise gift will send me snapshots taken on their smart phone on the wedding day. That’s ok too. The final illustration may be more a creative interpretation of the bouquet if the images are blurry or taken from an awkward angle. But the gift-giver will have the opportunity to approve the drawing at every stage. And I can always do some detective work via the bride’s florist, if required. b. Gift Voucher (£295) for gift-givers to give on the wedding day . This option includes a beautiful voucher printed on luxurious paper stock, presented with an additional envelope, ribbon and a sticker – meaning the gift-giver can sign the card themselves before gifting. The voucher is valid for one year from the date it is posted out to the gift giver. It will be posted first class to the gift giver within five days of purchase. I will offer the happy couple an email/phone/FaceTime consultation about the illustration. 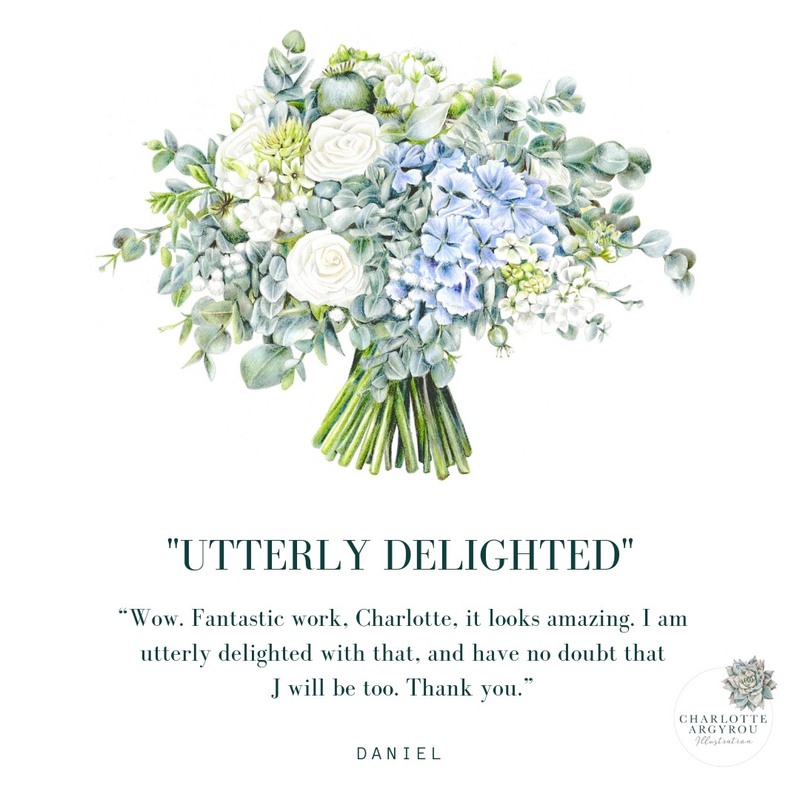 Most just chose to chat with me over email, as it means I can attach pencil sketches for approval, perhaps a colour palette if we are changing some details from the original bouquet. We will agree the dimensions of the illustration – either a 30 x 30cm square or 40cm x 30cm (landscape/portrait) – according to the composition of the bouquet. Don’t worry if you are unsure, as I will make my recommendation for what I believe will work best. Some people are happy to say “do your thing” (literally, I’ve been told this…) and let me make all the decisions. It really is up to you. I believe a commissioned piece of art is truly intimate and personal, so I’m happy to send updates throughout the process, or just surprise you at the end if you prefer. The illustration will be delivered directly to the couple, signed and mounted, via Special Delivery (signed for and with insurance), within one month of receipt of photography. No digital version will be surprised. I’ll check with you before I send the illustration, ensuring I have the best address to receive a signature with the least amount of bother. 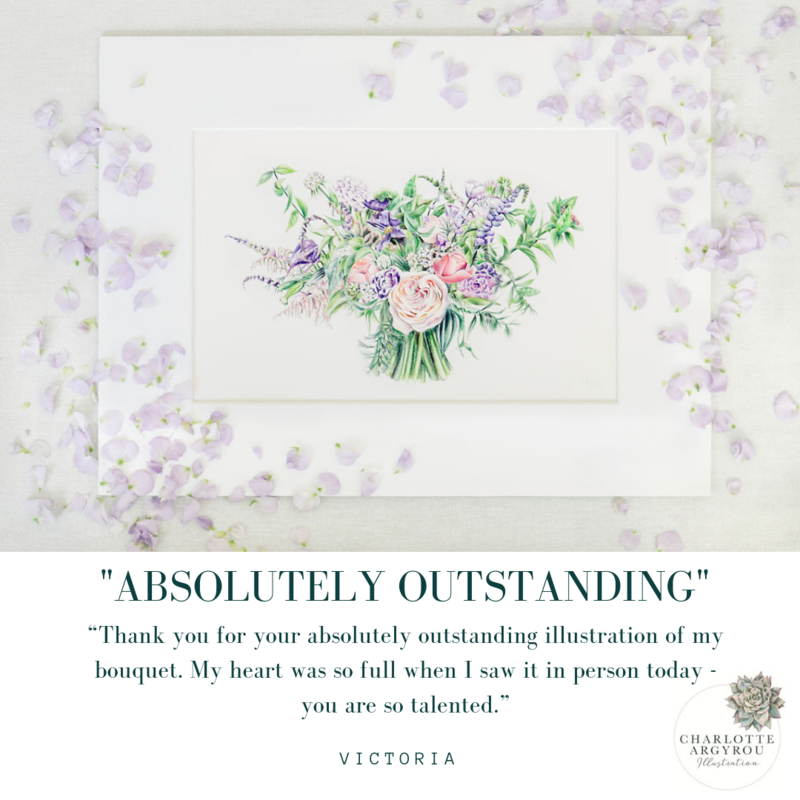 My business grows when my customers send a few words for me to use as a testimonial, or feature my work on their social media. I love this. Truly. It makes my heart sing to know my customers love their artwork so much they want to shout about it. However, I retain copyright of the illustration, so the recipient would need to ask my permission before reproducing an image beyond this. Ie. it is fine to take a photo of the illustration and put it on Facebook or Instagram, crediting Charlotte Argyrou Illustration. It is not fine to reproduce the image on t-shirts and sell them for your commercial gain. If in doubt, just ping me a message and I’ll respond very quickly.